Disney (NYSE: DIS) is scheduled to announce its fiscal third quarter results on Tuesday, August 7. The company reported solid fiscal second quarter earnings, as both its EPS and revenues came in ahead of market expectations. 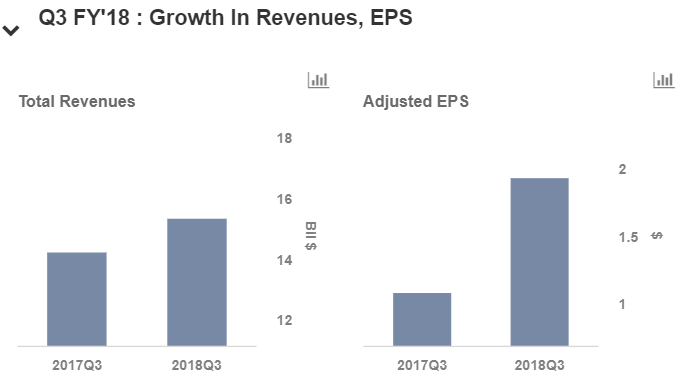 The company’s revenue grew 9% year-over-year (y-o-y) to $55 billion, primarily due to growth across operating segments. In addition, Disney’s adjusted EPS rose 23% y-o-y and free cash flow jumped 48% y-o-y to $3.46 billion. Disney’s stock price has increased slightly over the course of 2018, primarily due to the focus on the company’s new online streaming media service and the acquisition of assets from Twenty-First Century Fox. Our $120 price estimate for Disney’s stock is slightly ahead of the current market price. We have created an interactive dashboard on what to expect from Disney’s Q3 earnings which outlines our forecasts for the company’s Q3 results. You can modify our forecasts to see the impact any changes would have on the company’s earnings and valuation. We expect Disney to continue to post an increase in earnings and revenue growth rate in Q3, driven by continued growth in company’s international operations of Parks & Resorts (with another operational year of the Shanghai Resort) as well as a healthy film slate. Disney’s Media Networks revenue for the second quarter grew 3% y-o-y to $6.1 billion, driven by growth in affiliate revenue, offset by a decrease in advertising revenues. The company was largely impacted by higher programming expenses at ESPN and falling prime-time viewership. This trend could likely continue in this quarter as well. In addition, Media Networks operating income declined 6% y-o-y to $2.1 billion in Q2, primarily due to lower broadcasting results and lower equity income. Going forward, Disney expects BAMTech’s results to have an adverse impact on Media Networks’ fiscal 2018 operating income of $180 million compared to the prior year. This is $50 million worse than its previous estimates, primarily due to increased investment in ESPN+. It should be also noted that about $100 million of the full-year impact is expected during the third quarter. The studio benefited from the release of Avengers: Infinity War during the quarter, which collected more than $2 billion at the global box office. We expect a strong third quarter for the company with respect to its Studio Operations and Consumer Products segment, as the studio’s performance was relatively solid in the third quarter as compared to the prior year quarter. Disney continues to make enhancements to the park with the recent opening of the new Toy Story Land at the Shanghai Disneyland. The company also plans to open a new Star Wars Land in 2019 at both the Disneyland and Walt Disney World locations. Overall, we expect Disney’s theme parks to be an important driver for its long-term growth due to its international expansion. In the first half of fiscal 2018, the segment’s revenues grew 11% y-o-y and operating income increased 22% y-o-y.